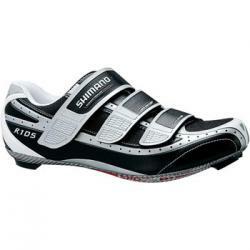 These are serious sport/competition road race shoes offering maximum performance and comfort. They are made from a stretch resistant synthetic fabric which ensures a breathable and durable shoe with and excellent fit. They have a triple-strap offset closure pattern which supports the foot securely and avoids pressure points, mesh panels and a supportive heel cup designed to add comfort, air holes in the sole that increase ventilation and reflective detailing on the heel which help keep you more visible in low light conditions. They also have a silver carbon fibre composite sole which is both lightweight and rigid, which efficiently transfers power to the pedals and is compatible with SPD-SL and Look* cleats.